Hundreds of miles from the North Dakota pipeline protests that garnered headlines earlier this month, a woman in Iowa stood in her soy bean field, trying to block industrial mowers about to cut down her crops. 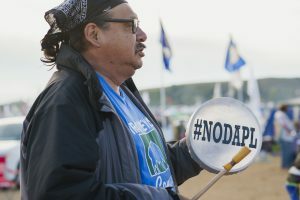 In North Dakota, the Standing Rock Sioux have argued that a portion of the Dakota Access oil pipeline would threaten their drinking water and their sacred lands, and their protests prompted the federal government to halt construction on that segment earlier this month. In Iowa, Cyndy Coppola and other residents have sued their state government for allowing Dakota Access to seize their farmland for the pipeline, which would cut through Iowa on its way from North Dakota to Illinois. Pipelines are the safest and most efficient way to transport oil and gas, and it isn’t possible to meet the nation’s demand for fuel using rail or road alone. But as more oil and gas pipelines crisscross the country, environmental and energy lawyers say protests against them are becoming increasingly common. Landowners like Coppola are challenging pipeline companies’ use of eminent domain to take their land. Environmental advocates worried about pipeline leaks have been putting more pressure on state officials to put restrictions on the projects, or block them entirely. And state lawmakers have gotten involved, with Republicans saying they want to protect personal property rights and Democrats saying they want to protect water sources and the environment. Georgia and South Carolina passed laws this year that temporarily ban pipeline companies from using eminent domain. Residents there had concerns similar to those in Iowa regarding a proposed pipeline that would have carried petroleum from South Carolina to Florida. New York in April withheld a required water quality certificate from a pipeline that would have pumped gas from Pennsylvania to New York. And cities and towns in New Jersey have passed laws and resolutions in an attempt to stop a company from building two parallel pipelines running there from New York. The yearslong national debate over whether to approve the Keystone XL pipeline may have contributed to the general opposition to new pipelines, as people began to associate pipelines with climate change, said Bob Hogfoss, an attorney who represents pipeline companies. Environmentalists said the proposed 1,200-mile Keystone XL pipeline would have dramatically increased carbon emissions and President Barack Obama eventually rejected it. Pipeline leaks only add to concerns. This month, up to 336,000 gallons of refined gasoline spilled from a pipeline in Alabama, killing plants and wildlife and worrying locals that the gasoline would contaminate a nearby river. Environmentalists argue the sheer quantity of oil or gas being transported by pipelines and a lack of oversight have the potential to do more damage than trains or trucks. The approval process for pipelines varies, depending on what they will transport and whether a pipeline system crosses state lines. Pipelines that transport oil, as well as pipelines that transport oil or natural gas within a single state, are approved by that state. Pipelines transporting natural gas across state lines must be approved by the Federal Energy Regulatory Commission. The commission approved 35 major natural gas pipelines last year, tied with 2007 for the most of any year for which data is available. States rarely block proposals for new oil pipelines, although in recent years some have beefed up safety rules. Yet questions are arising in multiple states over whether private companies have the right to use eminent domain, the power to take land for a public purpose with just compensation, for projects that are sometimes unregulated by the state. Eminent domain laws for pipelines vary by state. In many states, pipeline companies must get approval from the state before using eminent domain. In Kentucky last year, the Court of Appeals ruled that eminent domain can only be used by pipeline companies if the pipelines are regulated by the state’s Public Service Commission. Farmers in Iowa argue that the Dakota Access pipeline doesn’t meet any public need, because it carries oil across the state without supplying oil to it, and thus the state shouldn’t have granted the pipeline company eminent domain powers. The Iowa Public Utilities Board in March voted to approve the use of eminent domain, writing that the pipeline would carry crude oil more safely than the alternatives, and that the construction and operation of the pipeline would bring jobs and other economic benefits. So far, Coppola said her family has spent at least $25,000 trying to fight the board’s decision. Meanwhile, the company building the pipeline agreed to pay the family $8,500 for four of its 80 acres, and moved forward with the project, building and burying the pipeline across part of the farm. The resistance in Iowa, Georgia and South Carolina centered on eminent domain, but the fights started in part because landowners were worried about what the pipelines would do to their property and the environment. The nutrient-rich soil in Iowa is a rare commodity, Coppola said. The pipeline that faced resistance in Georgia and South Carolina would have run through conservation land and crossed five major rivers and numerous tributaries and creeks in Georgia, potentially harming habitats and the ecosystem, according to the Georgia Conservancy, a local nonprofit. The group also argued that there was no need for additional fuel in coastal Georgia, where the pipeline was to be built. When Kinder Morgan, the company building the pipeline, first started approaching property owners, it “started a real ruckus,” said Georgia state Rep. Bill Hitchens, a Republican. Hearing the concerns, the state denied Kinder Morgan the right to use eminent domain. “There was no real benefit to Georgia,” Hitchens said. Hitchens supported the new Georgia law that put the use of eminent domain for pipelines on hold for a year. A similar law in South Carolina did the same thing, for three years. Legislative commissions in both states are using the time to consider if and how to change the law permanently. Meanwhile, landowners in the states now recognize that they have the power to speak up against eminent domain for this use, said Bonitatibus of Savannah Riverkeeper. When it comes to natural gas projects crossing state lines, states have long relied on the Federal Energy Regulatory Commission to ensure the safety of proposed projects. But environmental attorneys, such as Alex Bomstein, of the Clean Air Council, say the commission has become a rubber stamp for pipeline projects. Earlier this month, in a letter to the U.S. Congress, 180 environmental, energy and community planning organizations from 35 states called for a change to the Natural Gas Act, which gives the commission the authority to approve pipeline requests. The coalition argues that the federal agency is abusing its approval power, “resulting in uncontrolled and irresponsible proliferation of unneeded natural gas pipelines.” State and local governments should be given more power to address eminent domain and environmental concerns related to the projects, the coalition says. Pipeline projects should be subject to all environmental and community protection laws, just as all other industries are, said Maya van Rossum, leader of the Delaware Riverkeeper Network and a co-signer of the letter to Congress. As part of the commission’s approval process, states may have one tool to block projects: withholding a certificate stating that the project meets water quality standards. But lawyers representing energy companies and environmental groups disagree on whether states can do this, given the current law that gives the federal government the final say on natural gas pipeline approvals. In a rare move, a New York state agency in April denied a water quality certificate for a 124-mile project that would have run through the state from northeastern Pennsylvania, saying the pipeline company failed to prove that the project would not harm the 250 streams it crosses in the state. The decision is “important and powerful and it is demonstrating to states across the nation that they do have the capacity to say no, and they should embrace that authority,” van Rossum said. Energy companies say the new pipelines are needed to transport oil and gas from new places. The use of hydraulic fracturing, which has given companies access to oil and gas deposits that used to be out of reach, has increased production across the country, from California to Pennsylvania. Trains and trucks are often used to get the oil from these new sources to refineries where the oil is processed, and transporting it by pipeline would be much more efficient. Since the Keystone XL debate, every pipeline project seems to be meeting the same resistance that project did, and the opposition threatens the economy, said Martin Durbin, executive director for market development of the American Petroleum Institute, at an event for the energy industry in April. “We have to have this infrastructure in order to achieve and realize all of the benefits from an economic growth standpoint, from an emissions reduction standpoint, and to continue to grow on the U.S. role as a global energy leader,” he said. Both Durbin and Melissa Ruiz, spokeswoman for Kinder Morgan, the largest oil and gas pipeline company in the U.S., said the energy industry and the government need to do a better job of educating the public about how safe and important the pipelines are.